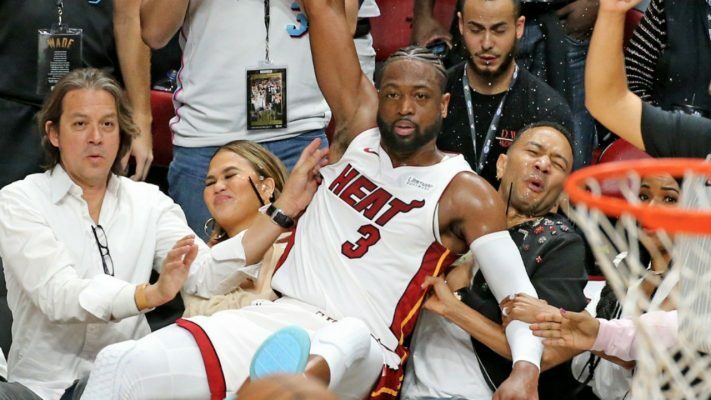 During Dwyane Wade’s final NBA game in Miami, the Miami Heat legend used celebrity couple John Legend and Chrissy Teigen as a cushion following a fadeaway jumper. When he appeared on “The Tonight Show With Jimmy Fallon,” Wade took the time to discuss his retirement, his family, and of course the hilarious picture of himself, Legend, and Teigen which went viral following the game. He then broke down what was going through his head in the exact moment that he fell back onto the two superstars. Finally, Wade pointed out one final hilarious aspect of the picture involving his wife, Gabrielle Union. While Wade’s final season in the NBA did not end in the playoffs as many had hoped, it was still a wonderful sendoff nonetheless. Now, with his NBA career behind him, Wade will have a lot more free time to figure out ways to pay Legend and Teigen back for their lost drinks.